Responding to disasters and emergencies is hard work. It is even worse when technology fails. Don’t let your agency fall victim to the following five technology blunders. The worst time to discover that you need to update your software is during an emergency. When seconds count, the last thing you need to see on the screen is an operating system warning box, the infamous swirling hourglass, or an error screen. For those of us that routinely defer downloading updates, the consequences can be lead to unexpected delays. Recently, I heard of an agency that arrived at their continuity of operations facility only to discover that none of the continuity personnel could log onto any of the computers at the hot site. All the computers had to go through an extensive update process before the continuity personnel could even log in! Using online forms, databases, automated ICS forms, and sophisticated mapping and dispatching systems has revolutionized the emergency management field. Never before has the field had more automated, electronic, and interoperable solutions for managing incidents, emergencies, and disasters. The problem is that technology can fail. Whether due to utility failure, network failure, or other “technical difficulties”, all emergency management organizations must have a way of using paper documents and processes as a last resort. It seems that every week a new software package, program, suite, or other service offering is released and it is a “must have”, “all-in-one”, “state-of-the-art”, and even makes sandwiches! While it is always advisable to conduct thorough due diligence and market research, sometimes the marketing materials are just too good to be true. Emergency managers ought to be naturally skeptical regarding marketing pitches that seem to promise too much. With more IT systems being sold as “software-as-a-service” (SaaS), the need to log-in to multiple online systems using a unique username and password is becoming ubiquitous. Oftentimes, various IT systems force users to update passwords at different intervals. For many of us, if a username or a password fails to auto-complete, we would be lost or delayed while we search for a written note. Many of us keep passwords in rolodexes, sticky notes, or taped under our keyboards. But what if we need to relocate quickly? Will we have our passwords and usernames handy? Other emergency managers use smart phone applications to keep all usernames and passwords in one secure program. Discovering that you cannot log into your emergency management software during an emergency is definitely a lesson learned the hard way. Finally, many of us have had to learn that sometimes free software can meet or exceed the capabilities of costly, customized, and/or proprietary software platforms. Unfortunately, many of us have had to learn that a free software platform better meets our needs than a paid version after years of paying for the expensive stuff. 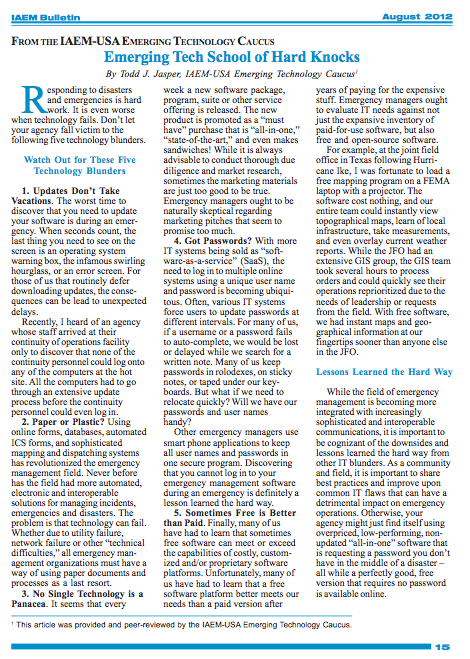 Emergency managers ought to evaluate IT needs against not just the expansive inventory of paid-for-use software, but also free and open-source software. For example, at the joint field office in Texas following Hurricane Ike, I was fortunate to load a free mapping program on a FEMA laptop with a projector. The software cost nothing and our entire team could instantly view topographical maps, learn of local infrastructure, take measurements, and even overlay current weather reports. While the JFO had an extensive GIS group, the GIS team took several hours to process orders and could quickly see their operations re-prioritized due to the needs of leadership or requests from the field. With free software, we had instant maps and geographical information at our fingertips sooner than anyone else in the JFO. While the field of emergency management is becoming more integrated with increasingly sophisticated and interoperable communications, it is important to be cognizant of the downsides and lessons learned the hard way from other IT blunders. As a community and field, it is important to share best practices and improve upon common IT flaws that can have a detrimental impact on emergency operations. Otherwise, your agency might just find itself using overpriced, low-performing, non-updated “all-in-one” software that is requesting a password you don’t have in the middle of a disaster–all the while a perfectly good, free version that requires no password is available online.